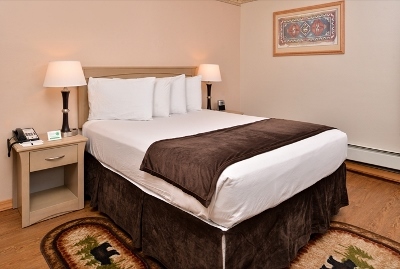 Characterized by its feeling for the American West, the Stage Coach Inn in West Yellowstone offers all the modern up to date comforts without sacrificing it's unique atmosphere as a much loved traditional base for Yellowstone Park visitors since 1948. Interior corridors connect all our guest rooms with the lodge lobby, breakfast room, brand new indoor swimming pool, sauna, elevator, ice and vending area, guest laundry, and the free heated underground parking garage. All rooms have full private bathrooms with bathtub and shower combination, free in-room high-speed wireless internet and direct dial telephones, 32 inch flat screen cable TV with remote, clock radios, coffee makers, hair dryers, heat and cool air conditioning. Free expanded continental breakfast is included with all rooms, and opens at 6 am in case you decide to get an early start into the park. Spacious and newer west wing rooms are over 350 square feet in size, and feature either one king bed or two queen sized beds. 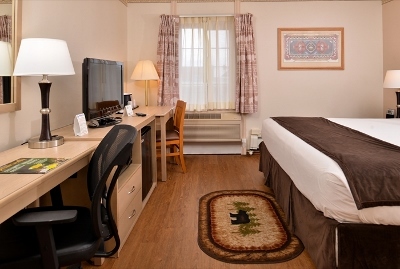 All deluxe rooms feature air conditioning with individually controlled thermostat, 32" flat panel color cable remote TV, microwave, fridge, free wireless internet, phone, desk with ergonomic chair, custom decor, hairdryer, coffee maker, and full private bathroom with tub/shower. Ground floor or second floor rooms available. You can use the elevator or the stairway to reach the second story. Generally smaller, but very comfortable rooms located up the sweeping staircase (or via elevator) on the second floor in the original building above the knotty pine lobby. King or queen size beds are available. The original rooms average approximately 210 sq. ft. and vary in size and shape, so if you have a favorite, please let us know when you book your room. If it is important to you to have a large room, then please book a deluxe room type. 32" flat screen color cable remote TV, free wireless internet, phone, hairdryer, coffee maker and clock radio. (No microwave or refrigerator.) Full private bathroom with bathtub/shower. Individually controlled heat and air conditioning. Use elevator or stairs to reach the historic rooms.